All smartphones and tablets running Apple iOS or Google Android have quite impressive musical abilities. It would be a sin not to use them and turn your iPhone or Samsung Galaxy S III/4 into a real music box. 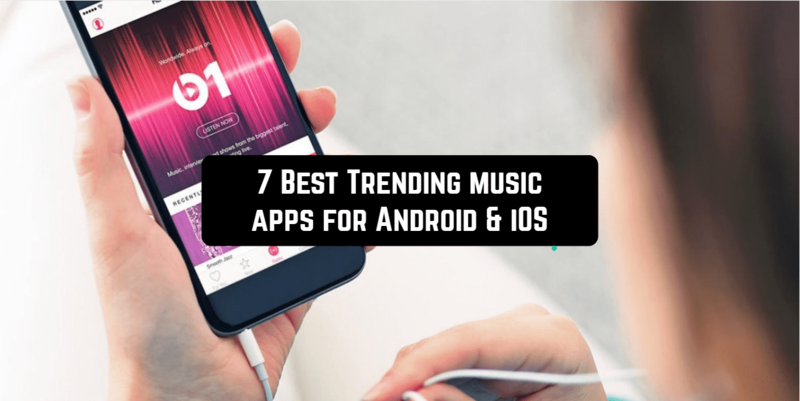 Well, we will tell you which trending music apps to pay attention to. 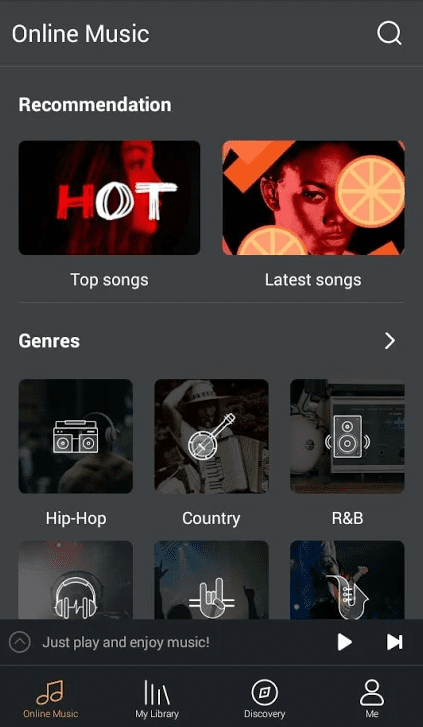 Audiomack Music & Mixtape is a free application for searching, listening and downloading the latest novelties of modern music. The program Audiomack was created in order to please music lovers with their favorite songs and to facilitate the search for something new. If you listen to rap, R&B, hip-hop – you have found what you need. If you love reggae, you’re welcome here. If you are fond of electronic music, you are here again. The app contains all the popular and not very tracks of world artists. Any of them is available for listening for free. You can add selected songs and albums to your favorites, create personal playlists and enjoy music wherever you are. You can go to the “Top” tab and get acquainted with what other people like, what they listen to and appreciate in the world. Most songs can be downloaded to your device to listen offline. And all this is completely free and even registration is not required. If you want to support the application, you can buy a paid version, which will differ only in the absence of advertising. PlaYo – Free Music and Radio – listen to your favorite music, choose the best songs and create your own playlists without any payment and restrictions. 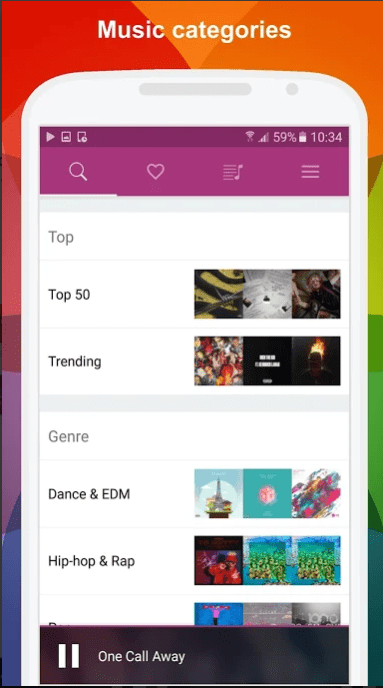 The application contains a huge library of trending music that will become completely accessible to you. The application provides access to millions of popular songs and allows you to play them without any commercial breaks. Thanks to agreements with various large rightsholders and access to SoundCloud API, the application will provide you music for every taste, beginning with modern rap and rock ending with national and western pop music. Find music for your mood, sort by genre and artists, create playlists and get access to your favorite music on several devices through authorization of one account. The application allows you to listen to both streaming music via the Internet, and your own tracks that are in the memory of your smartphone. Also in the application, there is a built-in radio station, which a huge number of frequencies. The application works fine in the background even in parallel with other programs running. 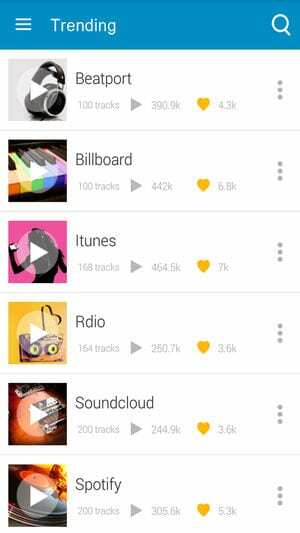 Trending Music Player VIBBIDI is a free application available for Android and iOS platforms. It allows to collect your favorite music and create your own albums based on your preferences. It has millions of songs for free. Here you will find trending chart toppers and rare singles. VIBBIDI’s intelligent timeline recommends trending songs and new music, based on the artists you like and the music you collect. Here, you can join the live discussions with other users. No subscription is needed. The music can be streamed in background mode. 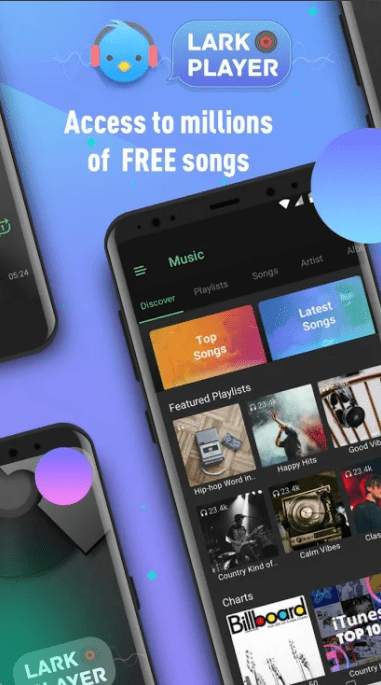 Lark Player is the application with which you will get unlimited access to millions of free trending songs through the music library of YouTube. The built-in search engine will find any songs, albums and even individual artists and their singles. 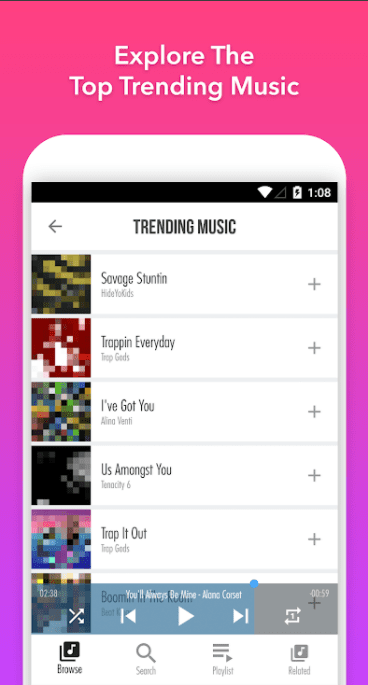 Developers of the application constantly add new songs to the built-in list of playlists, which contain a similar music genre. You do not have to create your own playlists – just see what the player offers. A special application catalog contains information about top charts of America, Brazil, Europe and the world. All music in the application is divided into genres, such as electronic, hip-hop, reggae, classics, rock, pop and others. All music in the application is available in the highest quality. Among the possibilities of personalization, there are 10 different themes for the interface. To freely work with a smartphone while listening to music, you can change the size of the player, and also move it to any corner on the screen. To listen to music from an external library, you need a stable Internet connection. The application allows you to freely listen to a huge amount of trending music but does not provide an opportunity to download it. Free Music is a free music player with which you can listen to music anytime, anywhere. With Free Music, you can listen to the unlimited song. 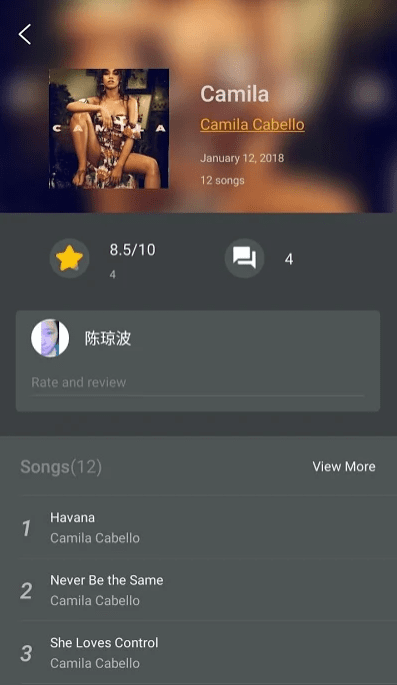 You can search by the name of the song, artist, album. You can also browse lists of the most popular artists and songs. FreeMusic is a great app to find and enjoy the trending free music without subscription limit. You can create your own playlists. Adding new songs and management is easy. 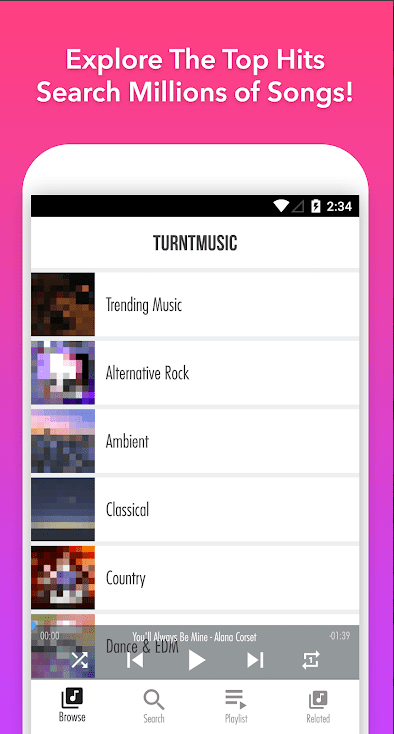 TurntMusic Free Music Streamer is an amazing and what’s more important free application for listening to trending music. TurntMusic allows you search and find millions of new albums and songs. Explore the top hits with TurntMusic on your smartphone! Millions of songs are available. You can create your own playlists adding favorite songs. 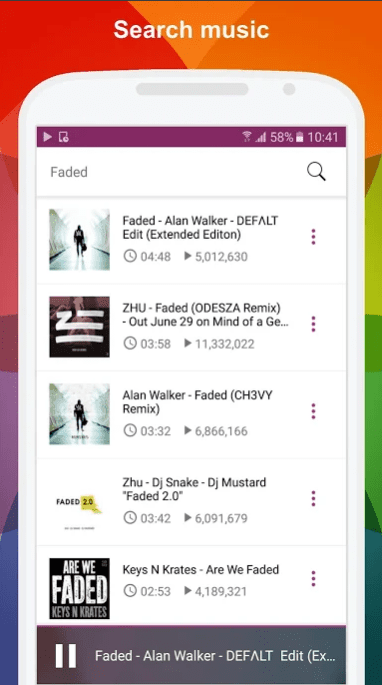 GO Music PLUS is your own Android-partner to search for interesting music. 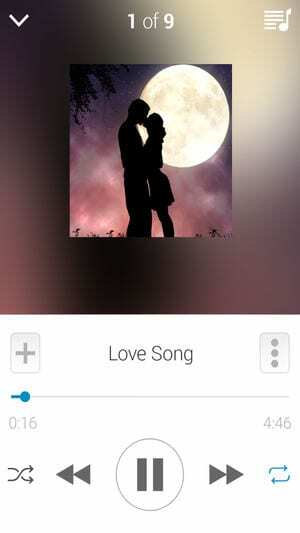 In this application, you can access all your favorite songs and artists at any time. The application is constantly being updated, and the more you use it, the better it works. Do you want to move away from the standard functions of the player? Then try an interesting visualization function and various lighting effects. The application is a stylish and modern player with support for various audio formats and light structure. The proprietary multi-band equalizer of the application serves to provide the most pleasant sound of songs. The application works fine with all popular audio formats. 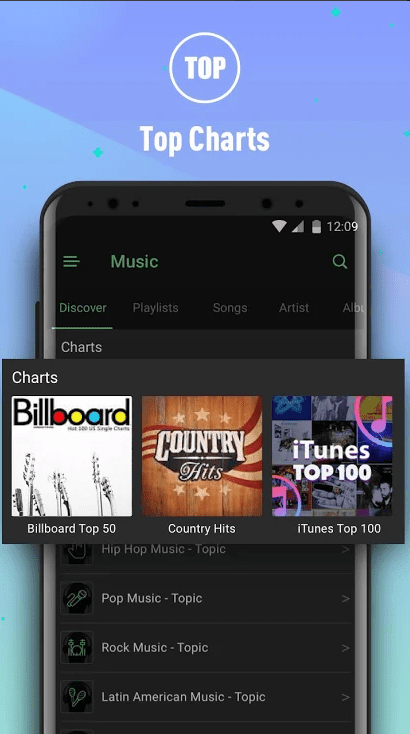 By connecting to a huge music library, you can always find fresh trend songs to your liking or use the suggested recommendations to get the freshest and most popular content. You can search and play music by genre, artist, title and other parameters. To enjoy listening, you can use one of 10 ready-made styles of music, including classics, flat, Heavy Metal, jazz, rock, rock’n’roll and others.